I recently received a message from friends in the market apprising me of the newest “trick” being used by those who like to move/manipulate markets. What are the wizards up to? Investors are constantly confronting the question whether it is safe to go in the water, that is, to commit capital and make an investment. With so much concern already surrounding the structure of and practices within our equity exchanges, there was serious fuel added to these fires with the malfunction and accompanying meltdown at Knight Capital this week. Why are investors increasingly less comfortable putting capital to work in the market? Why are investors increasingly less confident in the very structure of the marketplace itself? The simple fact is the supposed technological advancements embedded in high frequency trading have come with very real costs for long-term investors. The biggest advocate for investors in addressing these real costs has been Themis Trading’s Joe Saluzzi. I interviewed Joe twice over the last year and have referenced his work often. I commend Joe for often being the lone wolf within the industry crying out on these critically important issues. In the spirit of continuing the dialogue on high frequency program trading, please view this ‘mano a mano’ debate on CNBC. In one corner is Joe Saluzzi of Themis Trading. In the other is Irene Aldrige, Managing Partner of Able Alpha Trading. Mr. Saluzzi initially exposed this activity to the public in late June. Irene views this trading activity as a natural evolution of modern technology. Additionally, for those interested in further pursuing information on structural issues in the marketplace related to high frequency trading, here is a link to my Review of Sense on Cents Interview with Joe Saluzzi on High Frequency Trading from last August. Kudos to Joe Saluzzi once again. 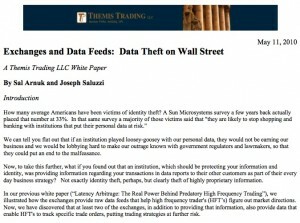 While a number of people in the markets have been pushing for increased oversight of high frequency trading, in my opinion, nobody deserves more credit than Joe Saluzzi of Themis Trading. The pressure initiated by Joe and pushed by others is starting to bear real results. How so? The highly predatory nature of ‘flash orders’ will likely be discontinued. Now we learn that trading activity in dark pools will also likely be seriously restricted. What are dark pools? Why should you care? If you have an interest in the markets, you should care. Let’s navigate. – Now every dealer and exchange have developed dark pools resulting in more and more business occurring off exchanges and without any benefit of transparency. Who is disadvantged? Those without access to the dark pools. – Dark pools initially had minimum size orders, but many dark pools have increasingly shifted away from a size requirement.